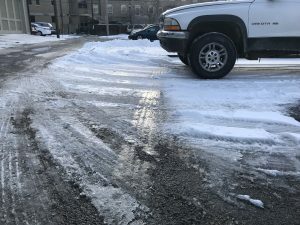 This winter’s weather challenged everyone who was out driving in it, but especially those driving tractor-trailers. 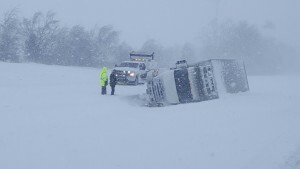 Some big rig accidents occurred during last week’s heavy snow, no doubt, as trucks weigh several tons and are hard to stop even during ideal driving conditions. The best thing to do during bad weather is stay home, of course, but not everyone has that option. If you’re called into work on a day when it is snowing, your bosses are expecting you to report for duty. Those who work in hospitals, emergency responders and city government officials have no choice. It’s their duty to take care of the rest of us – and we’re certainly all grateful for that. While truck drivers are limited in how far and how long they can drive in a day by rules created and enforced by the Federal Motor Carrier Safety Administration, the government agency has rules and regulations as it relates to adverse driving conditions. Adverse conditions means snow, sleet, fog, other adverse weather conditions, a highway covered with snow or ice, or unusual road and traffic conditions, none of which were apparent on the basis of information known to the person dispatching the run at the time it was begun.